Netflix and Chill anyone? Plus 10,000 points if you get the reference. 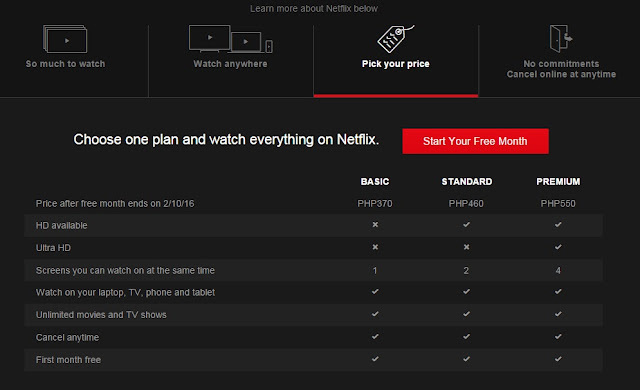 First off, Netflix recently announced that they would extend Globally extending to a few Asian countries. What is Netflix you asked? Here's a clip for better understanding. I was able to finish Season One of Unbreakable Kimmy Schmidt which is hella funny! Check it out! YOU.ARE.WELCOME! If you want to be married with your smartphone, then go ahead and enjoy the service. Here are the plans available for the taking. On your first month, you get it for FREE and the usual monthly payments will follow.